Former President Olusegun Obasanjo has expressed concerned over the continued threats of disintegration resulting from the activities of armed groups in the different regions of the country. 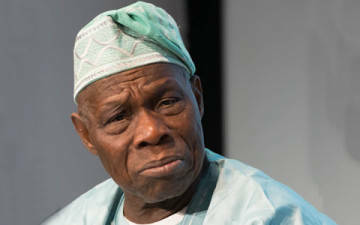 Obasanjo said Nigeria has never been as divided in history, except for the country’s civil war period between 1967 and 1970. Obasanjowho spoke yesterday at the maiden edition of the Nigeria Union of Journalists’ national summit held at Olusegun Obasanjo Presidential Library, Abeokuta, said the media should not fan the embers of disunity but rather take the lead in the marching towards greater national integration and development. The former president, who was represented by Peter Okebukola, a professor lambasted those calling for the breakup of Nigeria, arguing that the activities of the Niger-Delta Avengers, Boko Haram and Fulani herdsmen had fractured the country. “At no time in our history, except probably during the civil war, has Nigeria been so fractured in the feeling of oneness and belongingness by the citizenry,” he noted. He urged the media to support the efforts of government in fighting internal security challenges. “The press should mobilise the masses to strengthen the democratic process and play a crucial role in promoting a culture of tolerance, non-violence and mutual co-existence,” he said. “For me, this Summit will only be successful if we find a niche for the press in our march to ensuring greater national cohesion, especially at this time in our history,” he said. Obasanjo also charged the Nigerian media to pay close attention to investigative journalism, as most news headlines lacked credibility and were based on rumours. The Ogun State Governor, Ibikunle Amosun, while declaring open the conference, said it was important for journalists as professionals to always be on guard against forces to take advantage of their power for selfish interest. In his own remarks, Minister of Interior, Bello Dambazau said the power and significance of the media rest on their role of watchdog, stressing that the media through their reports help Nigerians in making informed decisions. Anybody, who lumps those brave and heroic Boys in the Creeks, aka;N’Delta Avengers, together with the Boko Haram and Fulani Herdsmen must be very very ignorant indeed. one of the sympathizers and sponsors of those Jihadist Killer Squads. the N’Deta Avenger might be,their cause is but a just cause. They are indigenous Nigerians,merely standing up against injustice, and they don’t go about that, slaughtering innocent children men and women.The N’Delta Avengers are yet to kill a single fly, not to talk of their fellow human beings. and ethnic cleansing with genocidal intent. can go peacefully our separate ways.